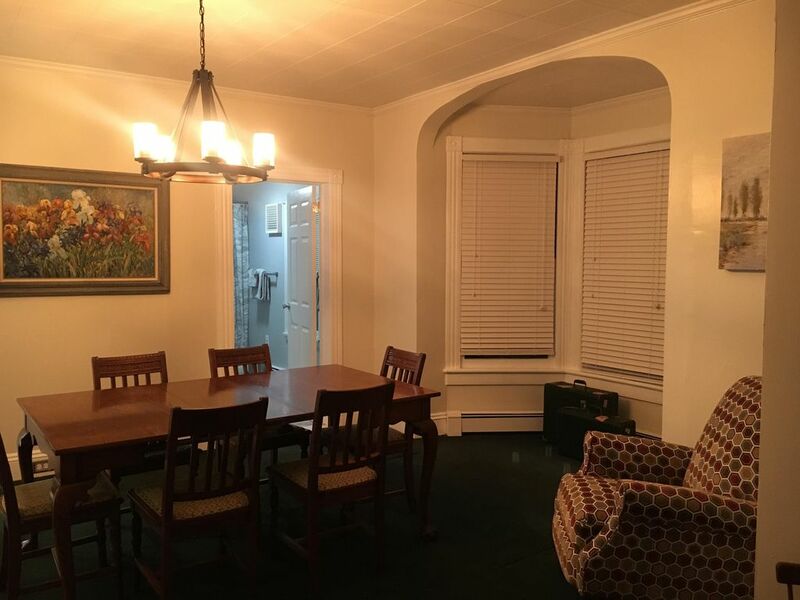 This first floor comfortable, classic American home is perfect for a getaway. A fully furnished and fully functional home that welcomes up to 6 guests. 2 bedrooms, 1 newly renovated bathroom and a sleeper sofa. All new mattresses and couches with classic local furniture from the right period of the home. Right in the heart of Pine Bush and minutes from great wineries and Watchtower Farms. This home offers the old time feel with updated function. As owners we are constantly looking for ways for our guests to enjoy their stay, we provide filtered water for you and your family The above portion of our home has permanent renters, however they are quiet, kind and accommodating. We offer WiFi and cable, t.v in each bedroom and living room if your looking for a night in. Or if your feeling out doorsey the beautiful ice caves hike is only 16 minutes away. When your back and beat we have a full kitchen and dining room. You can make drinks or grill outside. If your kind of relaxing is having someone else cook this home is walking distance to great restaurants that offer happy hour and amazing burgers. Private drive for parking and private entrance. Make it an adults only trip or bring the whole family. This beautiful home supports both. We have lived and volunteered in the area when we were single, met here, and now for the last 3 years are back as a married couple. We know many people come through the area to visit the beautiful Hudson Valley and the facilities here. We wanted to provide a nice home for visitors, one we would love to live in. We fell in love with this house the second we saw it. We will be painting the outside soon, but there is so much character in this jewel. We hope you feel that way also! Very quaint neighborhood and walking distance to so much in this special small town. Eating, cooking utensils provided. Wine opener, pots and pans, dish soap, paper towels, wine, and water glasses. Full dish set. This was the perfect place to stay. It was truly a home away from home. The property had everything we needed and we were made to feel welcomed. Everything was clean; from the kitchen, the bathroom, bedrooms and living areas. We would definitely use this property again. This was the Perfect home for us this week. Really enjoyed our stay. Will be back for sure. Staying here was everything the VRBO experience should be. The property was incredibly comfortable and welcoming and spotlessly clean, and exactly as advertised. Raquel (owner) is very warm and responsive and we had a lovely time with no surprises. Highly recommended! We chose this house because of its proximity to Watchtower Farms (about 8 minutes away!). It was great for our family of 5. The kitchen had everything needed for a quick meal, the living area was comfortable, the bathroom was large and updated nicely and the bedrooms were large with very comfortable beds and pillows and air conditioning and tv in each room. The water does have a very strong smell that is found in many of the older homes in the area, not sure if a filter or softener would help that? And there were only 2 bath towels in the bathroom. Perhaps a few more could be added? But overall this was a great location and a very comfortable home! We will be sure to tell our friends! Thanks for the review and for choosing our home! We will definitely be adding additional towels for future guests and apologize for any inconvenience during your stay. And yes, we have a filter on the water but I think we’re at the mercy of the town for the moment. But regardless we are so happy your family enjoyed their stay in Pine Bush! Hope you come back soon! Comfortable home, great location, great communication. We really enjoyed our stay here. The beds were very comfortable, the house was equipped with anything you’d need, and the location was perfect. The only thing that threw us a little was the smell of the water- the house must be on well water? It was hard to get our kids to bathe. But overall we’d recommend this home, it was very nice. Thank you! We appreciate the feedback, and enjoyed having you as our guests! Unfortunately you’re right, the town water that we have is on a common well and depending on the day there can be a sulfur smell to it. But it has been tested and is totally safe to use! We also have an additional filtration system within the home. Sorry it made bath time a challenge! Very relaxing and peaceful. It had all we needed to be comfortable. Close to shops, post office and grocery store.